As I type this post, we are flying over Canada. We left Atlanta airport almost three hours ago, and our information screen in front of us says that we have 10 hrs and 20 min to go. It hasn't been too bad yet, other than the delay we experienced in Jacksonville. The kids are doing great. In both flights, we had to play "divide and conquer," where Allan and I had to sit separately (but near each other) with one child next to us. I had LittleBit with me during our short flight to Atlanta. Now Peanut is next to me. She already enjoyed playing with sticker/coloring books, and now she's watching her 2nd movie. It still feels surreal that we're actually on our way to get Siana Lu. I think it will continue to feel surreal until we actually hold her in our arms. I want to take a moment to thank some special friends for their help with our journey so far. I know that I'll be forgetting some people, but please know that it wasn't intentional. -My dearest long-distance friends, Jael, Anna, Patrice, and Jen: thank you for taking the time to chat on the phone/Skype before I left. Thank you for praying over/for me and my family. I am so grateful to have such loyal, loving friends. -Our supportive long-distance families: thank you for making sure to catch up with us via Skype/phone before we left. Allan & Denise, Meg & Mike, Laura & fam, Adam & fam, we love you all. We can't wait for you to meet our newest family member! Your love and encouragement mean so much to us. -Our great friends in Jacksonville: Sara, Lianne, and Misti, thank you again for the most beautiful tea party shower you hosted for Siana's upcoming arrival. Thank you to all the friends who attended and all my MOPS friends, I am so blessed to have you as my friends. Lisa, thank you for organizing the vintage pearl necklace gift...I can't wait to order mine with the names of all my girls! Thank you to all the generous friends who donated money for Siana's orphanage. Thank you to all the friends who wrote a special note for Siana (we are still accepting, by the way, refer to a previous post "Ways to Participate"). Thank you to the Dillons for inviting us over for dinner before we left; your family has been a constant encouragement throughout this journey. Thank you to the Murrays for their constant encouragement and support. We enjoyed spending one of our last few nights before travel at your house and at the splash park. Paul, thank you again and again for all the techie support! 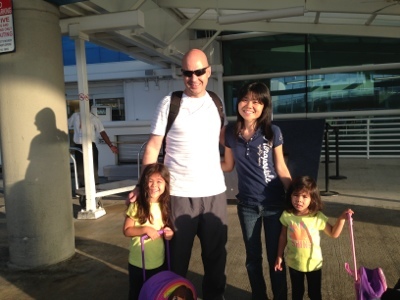 Thank you, Victor and Ashley, for coming over so early in the morning to take us to the airport! Thank you to our neighbors Mike & Katie for watching over our house while we're away. -Big thank you to my parents for joining us in Japan and for their constant support, help, and love. -Thank you to our friend Christina for pulling strings to get us a sweet deal at a hotel in Beijing. -Thank you to my friends Whitney, Tiffany, and Lifeline families who have given me so many helpful tips from their own adoption experience. The resources have been so valuable. I know I'm forgetting some people...please forgive me, as now I'm typing this after 12+ hrs in flight. We are almost there! Most of all, thank you to so many of you for your prayers. We have already seen the fruit of all the prayers. The girls did AMAZINGLY well during our 13-hr flight. One prayer we received was that the girls will do so well that the only explanation for it will be the power of prayer. Well, I can testify that this prayer was certainly answered! No complaining, fussing, or meltdowns. They were content for the first half and sleeping for most of the second half. Amazing. God is gracious, and His favor is all over this trip already. Just by typing all the list of thank you's, it's easy to see how so very blessed Siana is already to have such wonderful people in her life. When this post has published onto the blog, you'll know that we landed safely in Japan. We'll be here visiting family for a few days and head to Beijing on Thursday. Forgive me in advance for all the grammatical and spelling errors that will be made on the blog during this trip, as I will be typing in a hurry every time. P.S. The picture is from the start of our adventure at Jax airport.